The Shadow of the Wind, by Carlos Ruiz Zafon, is one of those very rare books that my sister, my brother and I all really enjoyed. (In fact, it may be the ONLY book that all three of us have enjoyed.) So whenever a new book in the series comes out, we get very excited and all try to read it around the same time so that we can discuss it. That's what happened with the newest installment in the Cemetery of Forgotten Books series, The Prisoner of Heaven. 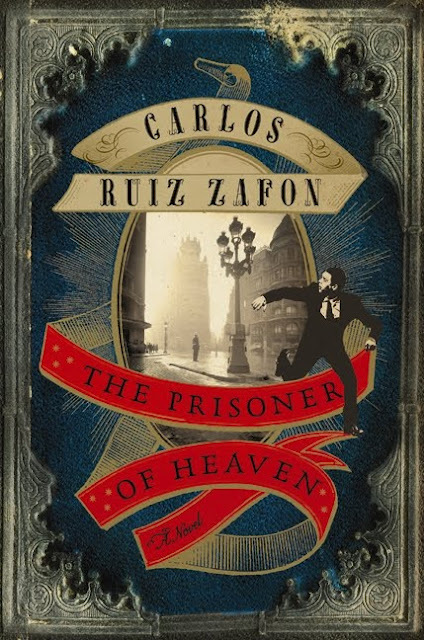 I did not re-read the other two books in the series before starting this one because Ruiz Zafon says that each book can be read and understood on its own and that you can read the books in any order to get the full story. I must say that I disagree with this statement. There were so many names mentioned in this book that were vaguely familiar to me, and I think that if I had re-read the previous installments in this series, I would have made the connections and enjoyed The Prisoner of Heaven much more. The Prisoner of Heaven picks up soon after the end of The Shadow of the Wind. Daniel Sempere, his father, and his best friend Fermin are all still working in their bookstore. One day, a frightening man to whom money is no object comes in looking for Fermin. He purchases a copy of The Count of Monte Cristo, writes a note in it for Fermin, and hands it to Daniel. When Daniel gives it to Fermin, his friend becomes very frightened and finally tells Daniel about his past, and just how closely connected he is to Daniel. It is possible that I just missed a lot of what happened in this book, but it felt very incomplete to me. The ending made very little sense to me and throughout the book, I just felt like Daniel was being slowly poisoned by this obsession to learn more about his past, even though everyone told him to drop it. He was not likable in this book. He ignored his present and his future in his hopes to understand his past. This is something that annoyed me about Rain Village when I read it a few years ago - I just don't understand this obsession with closure and finding out everything that ever happened to people when they specifically do not want you to know. One of the things that really stood out to me most about The Shadow of the Wind and The Angel's Game was the fact that Barcelona itself was a main character in the stories. This is less true in The Prisoner of Heaven, mostly because a significant portion of it takes place in a prison. The spooky atmosphere was present, but the magic of the first book was missing. Out of the three books, I liked The Angel's Game the most, and found it to be the most intense and scary of the three. The first book is also a favorite of mine, and I liked this one a lot, but not enough to move it to the top spot. I agree that the books should be read in order, because if not, there is so much that the reader misses out on. I'm glad that you got to share this one with your sister and brother though. I wish I had siblings to read with!! It's always great when you share a love for an author with family/friends as you can have some great discussions. I've still not read Shadow of the Wind....every time I see a Zafron blog post I promise myself I will read it soon, but I just never do. I haven't read any of the books in the series and think I may have given away my copy of The Angel's Game. Not sure why now. I think it's wonderful that you and your siblings share an interest in these books. I'm always happy when my husband and I can agree on books--it seems to rare! You've just reminded me to get a move on and finally get started on Shadow of the Wind (which has literally been sitting in my book case for years). Good to know that it's better to read the three books without too much time between them, lest it starts to get confusing (sounds like Song of Ice and Fire, but no way I'm re-reading all those books). I still haven't read this author despite having book 1 and 2 in my TBR! I have even started The Shadow of the Wind a couple times... Must get to it! The only thing tempting me is that it mentions The Count of Monte Cristo, which I just finished. But I remember so little of the other two books that I'm sure I'd just end up frustrated. That is so cool that you have a family book club of sorts! I wish more of my siblings enjoyed reading as much as I do! I agree with your assessment; this is the least successful of the three. Angel's Game seems to be the most developed -- though I really did enjoy Shadow of the Wind as well. I hope there is more Barcelona once again in part four! Pity it wasn't as good as the others, but maybe that will be good when you come to discuss it with your siblings - lots to talk about and so on. Good that you've found a series that you all like! I loved Shadow of the Wind but haven't read Angel's Game yet. Maybe I should re-read first not sure now! Thank you for saying this, Aarti. I haven't read any of the books in the series yet but I do own this one. I'll be sure to read book #1 first. Have you read the short story that's related to the series? I was re-shelving some books the other day including The Angel's Game and thought I should probably read it sometime. I think I'm one of the few people who didn't love Shadow of the Wind though. Shadow of the Wind is one of my favourite books, but I just haven't been brave enough to read either Angel's Game or this one. I think part of the reason is that I read one of his YA novels and it was very average.